Citation Information: J Clin Invest. 2008;118(2):421-428. https://doi.org/10.1172/JCI33612. An important, unfilled clinical need is the development of new approaches to improve fracture healing and to treat osteoporosis by increasing bone mass. Recombinant forms of bone morphogenetic protein 2 (BMP2) and BMP7 are FDA approved to promote spinal fusion and fracture healing, respectively, and the first FDA-approved anabolic drug for osteoporosis, parathyroid hormone, increases bone mass when administered intermittently but can only be given to patients in the US for two years. As we discuss here, the tremendous explosion over the last two decades in our fundamental understanding of the mechanisms of bone remodeling has led to the prospect of mechanism-based anabolic therapies for bone disorders. Histology (A–C; original magnification, ×40) and composite schematic (D) of the BRC, which comprises the cells constituting the BMU — specifically osteoclasts (OCs), osteoblasts (OBs), and osteocytes — as well as the canopy of bone-lining cells and the associated capillary. (A) BRC in cancellous bone, demonstrating the location of the OBs along the bone-forming surface. The osteocytes are shown embedded in the bone matrix and the canopy of cells consists of bone-lining cells. (B) BRC in cortical bone (outer demarcation indicated by the broken line) that is filled with erythrocyte ghosts (EG) and OBs; a few OCs are also seen. CV denotes the central vessel of the Haversian system, which forms the basic structural unit in cortical bone. (C) BRC stained with an antibody specific for CD34, which demonstrates staining of endothelial cells in the marrow capillary adjacent to the BRC. (D) Composite schematic of the BRC, showing connections between the osteocyte network, surface bone-lining cells, and the BRC. 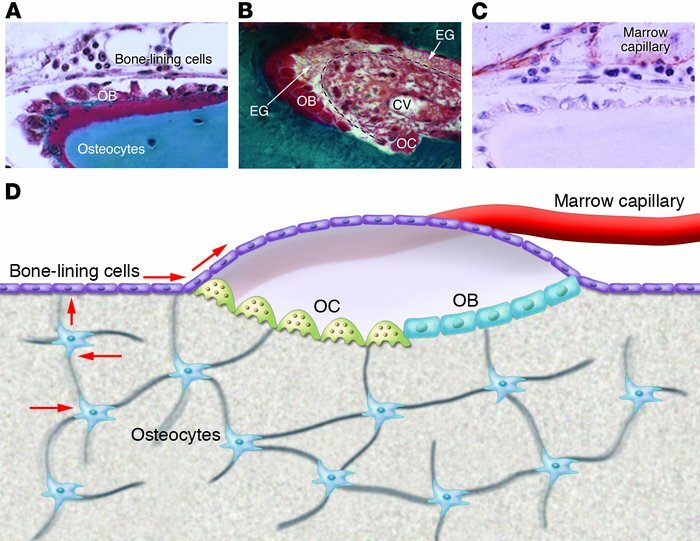 All cells in this network are connected with gap junctions, which might provide a pathway (arrows) by which signals generated by osteocytes deep within the bone reach the surface and elicit remodeling events by OCs and OBs. Note also the potential direct physical contact between OCs and OBs, which would allow for signaling between these cells. A and C are reproduced from Hauge et al. (7), and B and D from Eriksen et al. (10), with permission from the American Society for Bone and Mineral Research.